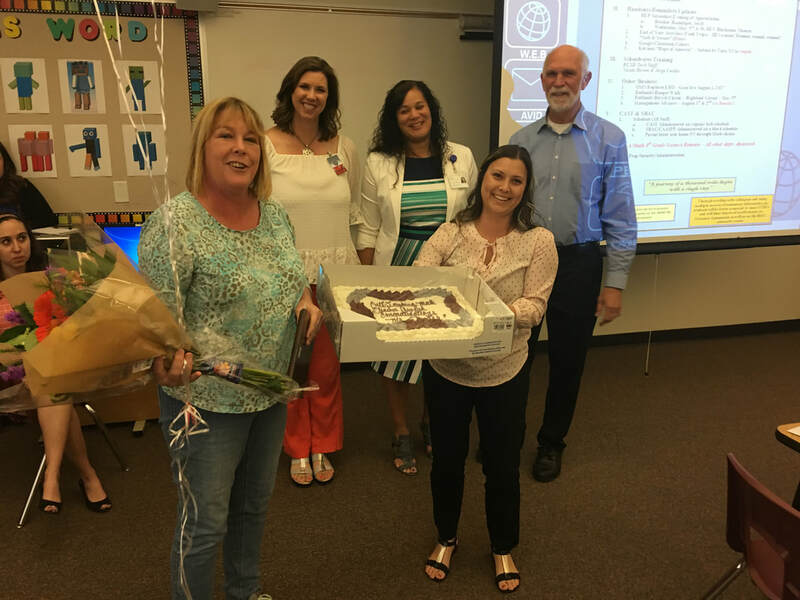 Each year RSBCMTA recognizes outstanding teachers of mathematics currently teaching full-time in either Riverside County or San Bernardino County. Honor a colleague or your child’s teacher by encouraging the teacher to complete and submit the application. • Complimentary registration for Fall For Math Conference, September, 2019. Candidates must be teaching full time at a K-12 accredited school in Riverside County or San Bernardino County and have been a full time teacher for more than five years. Download the application for all relevant information and description of qualifications. Due date for 2018-2019 will be in January, 2019. Consider nominating someone for 2018-2019. Visit this webpage in August, 2018. Return to this site in August to download the application form. The Riverside San Bernardino Counties Mathematics Teachers’ Association is a mathematics networking community that works to connect mathematics teachers in Riverside and San Bernardino Counties. We provide opportunities for math teachers to come together to share innovative ideas about teaching, learning, and collaborating..
and using this evidence to modify instruction and provide feedback to students in ways that support and extend learning. RSBCMTA selects up to two winners each academic year. Award winner(s) will be notified in Spring 2018 and will be invited to share his or her experience and ideas at an RSBCMTA event. Have at least FIVE years of teaching experience. Currently be teaching mathematics in either Riverside or San Bernardino County. The information and required documentation can be found online at http://rsbcmta.weebly.com/ . Applications must be typed or printed legibly and submitted electronically. Congratulations! 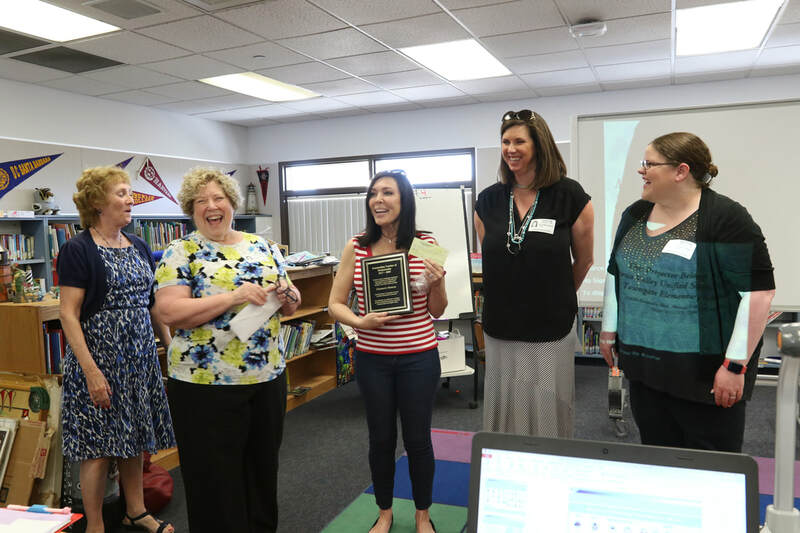 You have been chosen as the 2017-2018 recipient of the Outstanding Teacher Award presented by the Riverside San Bernardino Counties Mathematics Teachers’ Association (RSBCMTA)! After reading through your lesson description and your letters of recommendation, the RSBCMTA Awards Committee has chosen you as a teacher who exemplifies the qualities of an Outstanding Teacher! Your lesson was a typical 3rd grade lesson, helping students learn their multiplication facts. What first stood out to us was your objective, which was to identify patterns and use them to assist in developing automaticity of multiplication facts. You stated that you use sprints, with the intent of having students identify discuss patterns with other students. You stated that this activity helps students internalize their multiplication facts by connecting it to previous knowledge. This is in alignment with Standard for Mathematical Practice 8: Look for and express regularity in repeated reasoning. You were very explicit in describing the strategic instructional strategies that you chose for this lesson. The sprint led into development of fluency, where students explored the concept of multiplication: repeated addition of equal groups. You gave students time to notice patterns and talk about them, when working with their nines facts, and then went on to connect their ideas to different strategies for multiplying with nines. We appreciated the included dialogue, as it helps us see the evidence that you are describing. It was very interesting to read about how your students thought about 11 x 9, would the pattern still work? And they decided no because they couldn’t put 10 in the tens place. You encouraged multiple representations and welcomed mistakes. You continuously used formative assessment, to be sure your students were progressing. In your application, you stated, “I became a teacher because I love children and wanted to make a difference in their lives. I wanted to give children the encouragement and support they’d need to see that they could do anything they set their minds to, no matter their circumstance. I wanted a chance to help children see their full potential.” We feel that you are doing just that. You ARE making a difference and helping children realize their potential. You are a learner and a risk taker, with student achievement as the center of your focus and intention. We are happy to be able to recognize you for all of your hard work and achievements. We are honored to be able to present this award to you, and we would like to invite you to share your experience at our 2nd Annual Fall for Math Conference on Saturday, September 15th, 2018. We hope you will be willing to share your expertise, so that other local teachers (and students!) may benefit from your inspiring story and innovative ideas! Thank you for applying, and once again congratulations! 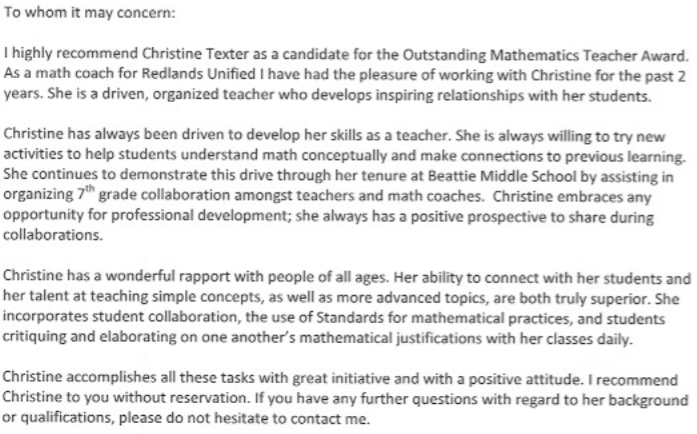 Christine Texter • Beattie Middle School • Redlands USD. 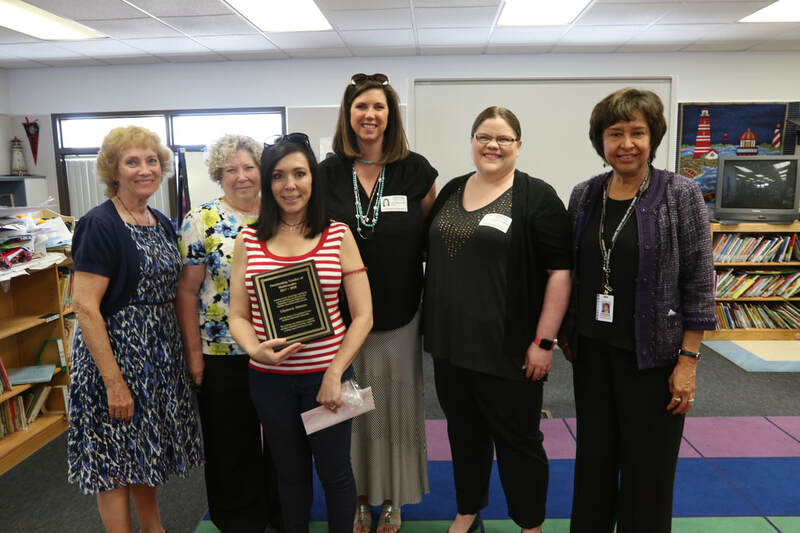 RSBCMTA awarded the Outstanding Teacher Award to Christine Texter, a middle school math teacher at Beattie Middle School in East Highland.. Out of all applicants, Christine best represented the ideals and commitment of our organization. as identified in three areas: Evidence of quality math teaching, background and experience, and letters of recommendation. Congratulations to our outstanding teacher of mathematics for 2016-2017, Christine Texter! Congratulations! You have been chosen as the 2016-2017 Riverside San Bernardino Counties Mathematics Teachers’ Association’s (RSBCMTA) Outstanding Teacher! You met all of the requirements outlined in the application. After reading through your lesson description of the Pig Pen Lesson, and your letters of recommendation, the RSBCMTA Awards Committee has chosen you as a teacher who exemplifies the qualities of an Outstanding Teacher! You were very explicit in describing the evidence that supports your quality math teaching. We appreciated the purposeful use of manipulatives; the opportunity for students to work in collaborative groups to problem solve; your inclusion of multiple representations in the lesson; as well as your use of questioning to facilitate both small group and whole group discussions. Additionally, we feel that your lesson did support the Common Core standards and Math Practices. We are confident that you are producing future mathematicians who will be college and/or career ready! This past school year RSBCMTA awarded two Outstanding Teacher Awards to area teachers. Out of all applicants, these two teachers reflected the ideals and commitment of our organization. Information was requested in three areas: Evidence of quality math teaching, background and experience, and letters of recommendation. Congratulations to these two outstanding teachers! Anthony Wren • Temescal Canyon High School • Lake Elsinore U.S.D. Anthony C. Wren is a mathematics teacher at Temescal Canyon High School in Lake Elsinore Unified School District with 30 years teaching experience. For the past several years he has been teaching AP Calculus, IBSL Independent Study, Algebra 2 for grades 9 through 12, as well as, remedial math. As a math teacher in the International Baccalaureate Program, he provides students with the opportunity to create a mathematical model and use that model to understand further the real world phenomenon from which the data was collected. The culmination of these lessons results in a research paper that is then graded with a rubric and counted as a summative assessment. This is the set of lessons that Mr. Wren shared with the OTA Committee. In the letters of recommendation from students and colleagues, Mr. Wren is described as a math purest and a true lover of the subject who eats, sleeps and breathes math and will do anything and everything possible to share his passion with his students and co-workers. 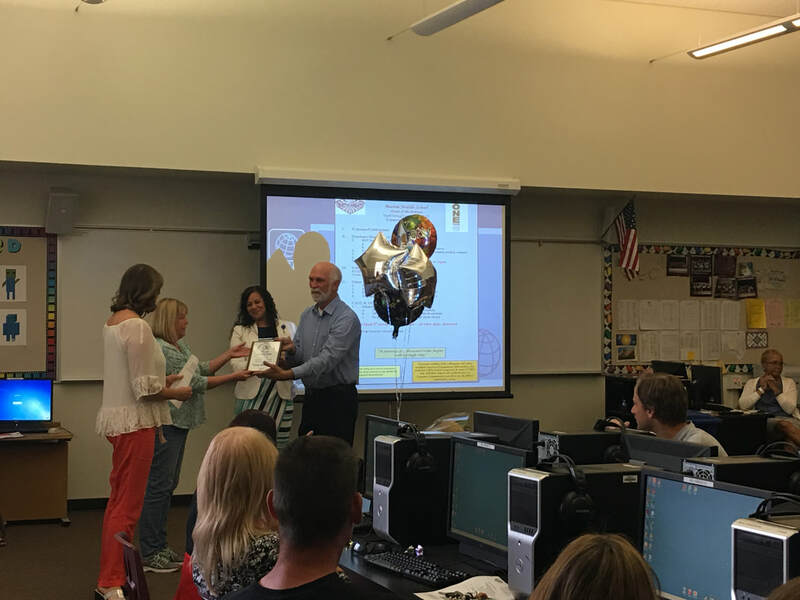 He has served as department chair, curriculum committee advisor, mentor, master teacher, site council rep, BTSA teacher, and WASC Committee Chair and was awarded site teacher of the year, district teacher of the year, and was the California League of High School Educators nominee. In his spare time, he works with troubled youth, migrant and immigrant populations, the homeless and indigent, and the elderly. Jason Slowbe • Great Oak High School • Temecula Valley U.S.D. Jason Slowbe is a mathematics teacher at Great Oak High School in Temecula Valley Unified School District with 11 years teaching experience. For the past few years he has been teaching Grades 9-12 math, Pre-Calculus, and AP Calculus AB. He has presented at more than fifteen conference presentations and worked on four different conference committees at the national, regional, state and local levels. His first article was published in an issue of the Mathematics Teacher and he has published and collaborated on several projects since. 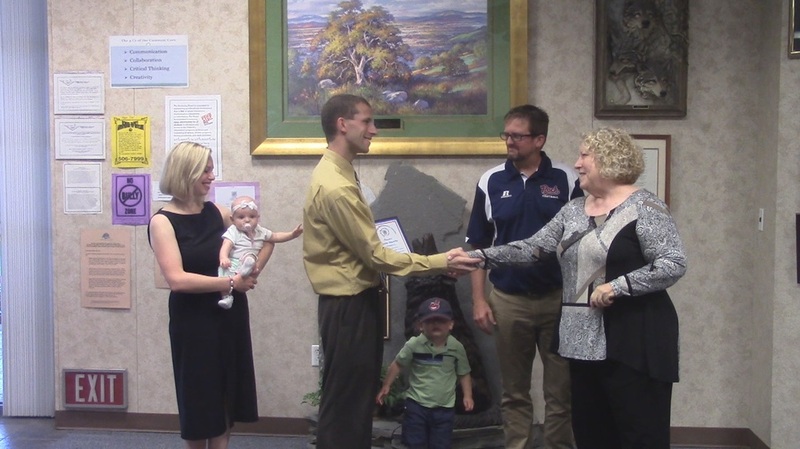 The driving force behind all of Jason’s student successes has been described as his foundational belief that every student can learn and that it is his responsibility and opportunity to make that learning happen. In his letters of recommendation from students and colleagues, Mr. Slowbe is described as an excellent curriculum designer, deploying varied tasks, demonstrations, and technologies to provide a rich learning experience that meets the needs of diverse learners. His lessons often feature innovative, interesting, thoughtfully designed simulations and projects for his students to explore. Award winners receive: a recognition plaque, a $250.00 check, and a one year membership in RSBCMTA. Encourage a colleague to apply for the RSBCMTA Outstanding Teacher Award for 2016. .